The Middle Years : Top 10: REAL Things I Have Heard at School Lunches! 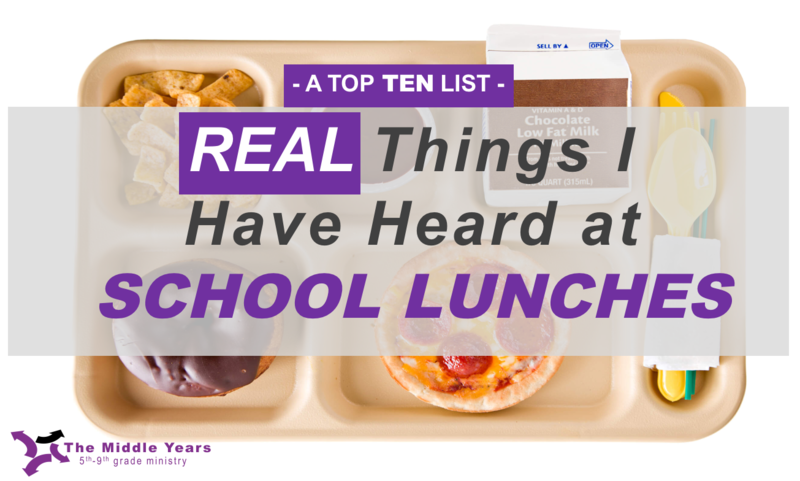 Top 10: REAL Things I Have Heard at School Lunches! - REAL Reasons My Child Can't Go on the Trip? - REAL Reasons to have to have a parent meeting? 9. Hey, Your Probation Officer is Here! 8. Hey! Come Meet My Pastor, so He Can Preach At You! 7. Is That Candy Laced With Drugs? 6. You re Kind of Old To Be Her Boyfriend! 5. Shhh...Stop ___________ The Youth Pastor Is Coming? 4. Do I Need to Pray for My Lunch, Since You Are Here? 3. Hey, Are You His Dealer? 2. Why Are You Here? Am I In Trouble? Did My Parents Call You about__________? 1. Oh! Did You Have a Day Off at Your Real Job! ?